AFTER reporting on how UKIP’s election results in England could impact on Northern Ireland, Steven McCaffery looks at how 48hrs later, Sinn Féin’s growth in the south also raises questions. AROUND a year ago a leading unionist confidently predicted to The Detail that Sinn Féin’s rise in the south would come to nothing. The private briefing revealed that they had made enquiries with the main parties in Dublin and been reassured that none were willing to enter government with Sinn Féin. It is highly unlikely the dismissal was the true opinion of the canny unionist, who knows only too well that anything is possible after the votes are counted. But the rebuttal matched the public reaction of unionist politicians, and many others in Northern Ireland, to Gerry Adams’ efforts in Dublin over recent years: they have simply chosen to look the other way. But now Sinn Féin has reached a level of success that demands attention. 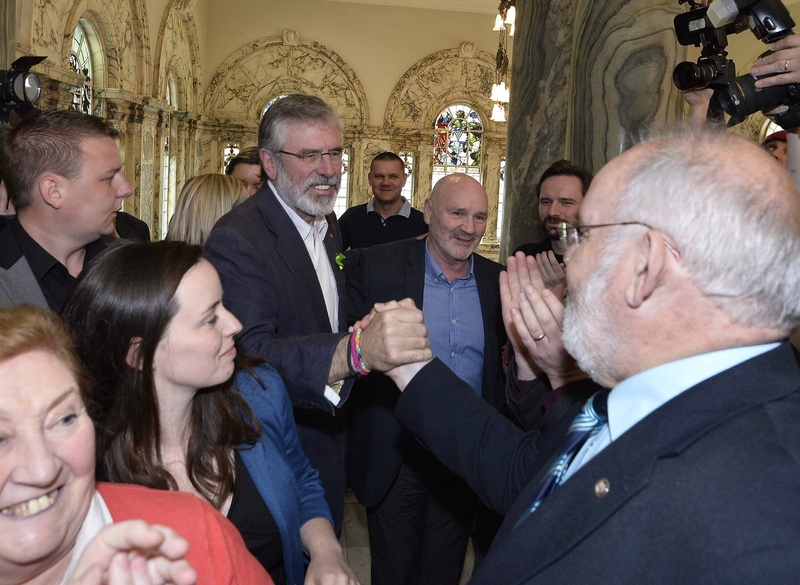 Gerry Adams has led his party to unprecedented levels of support since he jumped the border – but this week’s elections were the first time that Sinn Féin’s high opinion poll ratings were tested in a real contest. Its results in these elections show it has gone some considerable way towards achieving a key aim. In 2007 Sinn Féin’s predicted gains in the south’s general election turned instead into losses. The party’s southern project was swept aside, suggesting its support was skin deep. As The Detail previously reported, Gerry Adams said his party set about trying “to ensure that that never happened again”, by securing a “depth and a rootedness” in the south’s political landscape. The search for “rootedness” seems to have been significantly advanced. Even while the votes were still being counted, Sinn Féin quickly appeared to be on course to treble its presence on local councils across the republic and secure the election of three MEPs there. One of Sinn Féin’s European Parliament candidates Lynn Boylan was for a long time tipped to romp home in Dublin, while its candidate in the Dublin West Dáil by-election Paul Donnelly lost out on the seat but topped the poll. With Boylan in particular labelled a virtual unknown, the growth in Dublin is being attributed in part to support for the Sinn Féin ‘brand’. Some observers have said the reporting of the ‘Sinn Féin surge’ has been over-hyped. But it is of major importance that for the first time the party now has a wide network of councillors that gives it a political footprint right across the republic. It has also learned some lessons. Sinn Féin’s mid-teens vote share in the elections falls short of what was predicted in opinion poll ratings that placed it much higher. The party has tried to explain away this relative disappointment (which faded anyway as the scale of success in Dublin in particular became clear) by claiming that it has failed to maximise gains in areas where its infrastructure and membership levels are under-developed. Whatever the explanation, republicans have two years to work on that before the republic’s next general election. Despite the predictions that Sinn Féin hopes to sit in government in 2016, senior party sources have suggested it would not risk being a junior partner in government at too early a stage. Smaller parties have a habit of being punished by voters who become disillusioned with Dublin coalitions. The suggestion that Sinn Féin might instead stay on the opposition benches to continue growing the party is a signal of the long-term planning being employed. In the short-term it faces the task of proving its preparedness for government by building a good reputation at council level where it has now built a bigger bridgehead, but in some cases with relatively inexperienced representatives. Sinn Féin will be under greater scrutiny than ever. North of the border, it will study the mixed messages coming out of the battle for the downsized model of 11 Super Councils – with the emergence of smaller parties and concerns about maximising representation. But the big picture is that, in terms of first preference votes, Sinn Féin narrowly emerged as the biggest party in Northern Ireland. It is the biggest party on the councils in Belfast and Dublin. It has MEPs on both sides of the border and councillors on every part of the island. Critics predicting a false dawn may be proved correct in time – Sinn Féin’s gains have been won and lost in the past. Nothing is certain about where the party goes from here – the arrest of Gerry Adams at the start of the election is a reminder of how it faces political pressures that others do not. But Sinn Féin has reached an important milestone. Republicans are not certain of entering government in both parts of Ireland, but Gerry Adams has led them to a position where it is now entirely possible. How will other parties, and unionists in particular, strategise and react to this development? That might become clearer after the results of Northern Ireland’s European elections are announced. But wishing the issue away is no longer a safe option.